A bit more on pumps, a topic I’ve had a number of emails about. Now I’ve previously described my home made pump, and I trust all of you realise that I have no pretensions that this could be considered a ‘commercial’ quality pump for LPG. I also have an electric pump that I bought many years ago off a certain well known online auction site. I always figured that this was not ‘purpose designed’ for use with LPG, and I’ve always been very careful not to allow it to run dry. I’ve always assumed that this is a sliding vane pump, and (with a few specialist exceptions) those generally do not like running without lubrication – either from the fluid being pumped, or from lubricant introduced into the gas stream. 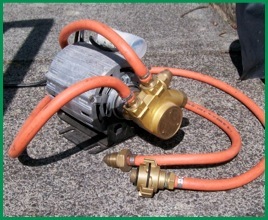 As you can see from the photo above, the vendor removed the ID label from the pump to avoid anyone looking it up and finding out how suitable, or not, it is for LPG. Now I have a stored search on said auction site and it emails me whenever new items are listed which match. Just occasionally there is a Smiths pump listed (one of the industrial grade pumps used on forecourts etc) which invariably go for more than I can afford, and even more occasionally a Krug hand pump pops up. Generally there is a fairly regular stream of electric and hand pumps that clearly aren’t purpose designed for the job. The PROCON pumps are not recommended for use with flammable fluids. The pumps are for use with fluids only. Furthermore, the vane tip speed of the vanes in the rotating rotor are most likely slicing vapor out of the LPG since the temperature at which the LPG turns to vapor is relatively low (-40 C). 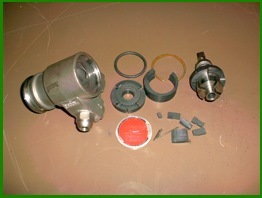 This vapor results in the pump cavitating which will ultimately result in premature failure. Attached is a presentation that shows what happens to a PROCON pump that undergoes cavitation. I would not recommend our pump for the use with LPG. Our pump is not an ex-proof device. Sharp eyed readers will see that it’s not the same make as the one I have – the Procon uses a circlip to retain the end plate, mine has a screw in plate. If anyone recognises the make then I would be interested to know. The milled faces on the end are stamped with “PR/3BZ” on one, and what I assume is a date code on the other. So as far as the pump goes, its down to proper use and making sure it is primed. Is there a window or a way to make sure there is liquid in the pump mechanism? No window. As long as it doesn't have air in it, then the head of liquid in the cylinder will prime it - the extra pressure will mean that vapour in the pump will condense and an equivalent amount will vapourise in the cylinder to make up the volume. It really is that sensitive to differences in pressure and/or temperature. However, if the pump is significantly warmer than the gas cylinder, then that won't work - so it's worth keeping them where they'll be at abut the same temperature. At my local filling place, a couple of times the pump has failed. In hot weather, the sun would heat the pump up and it would vapour lock – until the manager threw a bucket of cold water over it ! Essentially, the problem with pumping LPG is that you are reliant on pressure to keep it liquified, and since the system is so finely balanced, any slight rise in temperature, or drop in pressure, will cause the liquid to vapourise. As Procon point out, the sliding vanes will create a small amount of heat, and this will create a small amount of vapour in the area of the sliding tip. With luck, this is all that will happen, but when the cylinder is nearly empty then there is very little head and vapour lock can happen much more easily. If the pressure relief valve ever lifts (which is should do when the fill valves in the vehicle tanks shut off) then the liquid in the pump will very rapidly vapourise and the pump will run dry – and destroy itself very quickly. So what’s the conclusion ? Well quite simply, these pumps aren’t really suitable and will destroy themselves unless you really are very careful how you use them. I’ve always been very careful with mine, and I’ve still noticed a distinct drop off in performance – so it’s probably not far behind the state shown above. I would not recommend one of those small vane pumps, it’s not likely to last long. If you ever get the chance to buy a Smiths gear pump at a reasonable price, or a Krug hand pump, then take it. Otherwise, stick with a hand pump – and make your own assessment of whether it’s really purpose made for LPG, or something put together by someone with an eye on a quick profit and the apparent protection from any comeback provided by certain online auction sites.